Rev. 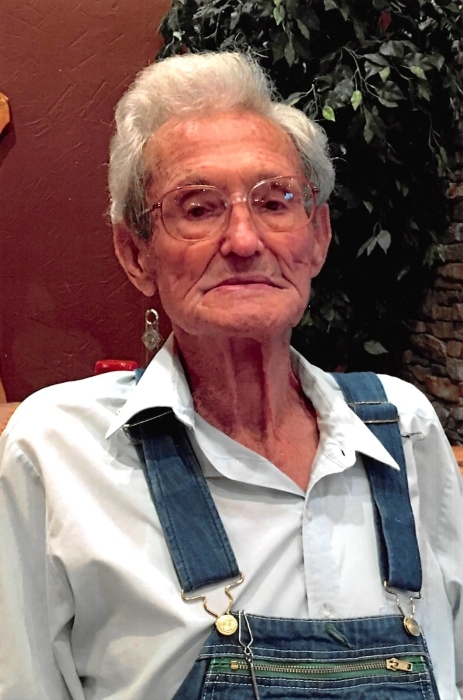 Roscoe Spradlin, age 95 of Parkers Lake, Kentucky died Thursday, November 29, 2018 at his home. He was born Sawyer, Kentucky on September 29, 1923 the son of Rev. Millard Eli and Delphia (Davenport) Spradlin. Roscoe had worked as a bridge builder and mechanic and school bus driver. He was a member of the Eagle Creek United Baptist Church, became an ordained minister in May 4, 1963. He was a member 3C’s when he was 18 years old and one of the first commissioners of the Eagle Sawyer Fire Department, served many terms as District 1 Magistrate, hosted many revivals in surrounding counties, and pastored many churches in the area. He is preceded in death by his parents; wife, Ida Belle (Perry) Spradlin, whom he married in March 27, 1943; daughters, Rebecca Stephenson, Violet Goodwin, Catherine Sumner; sons in law, Herbie Sumner, Ken Earl Goodin, Doug Stephenson, Benny Sumner, and Arlo Goodwin; 2 infant children; brothers, Carl Spradlin and Floyd Spradlin; and sisters, Nevada Taylor, Carrie Wilson, and Dora Spradlin. Survivors include his son Archie Spradlin and wife, Beatrice of Parkers Lake; daughter, Linda Sumner of Whitley City, KY., brother David Spradlin and wife, Rita of Parkers Lake; 13 grandchildren; 17 great grandchildren; and 19 great great grandchildren. Funeral services will be held Sunday, December 2, 2018 at 1pm at the Eagle Creek United Baptist Church with Rev. Rufus Hughes and Rev. Rusty Spradlin officiating. Burial to follow in the Roscoe Spradlin Family Cemetery. The family will receive friends after 5pm Saturday, December 1, 2018 at the Church.